I write about Guntersville lake a lot because I fish this lake a lot. It is one of my favorite lakes for big, largemouth bass during the winter season. With 69,200 acres of water and over 82 miles in length, that leaves a lot of water to explore on this man made impoundment (Alabama’s biggest), situated on the Tennessee River System. It has now been near 70 years since Guntersville lake was Impounded. Since 1939 both my Father and Uncle spent an entire life fishing Guntersville Lake. Since I was a teenager I fished with them and soon began exploring Guntersville lake on my own as owner of Reeds Guide Service. I’ve always looked at the lake with these years of experience, fishing and exploring it in every season. I visit this enormous lake in North Alabama every week and have seen over a dozen of its age old bass, many exceeding that magical mark of 10 pounds. 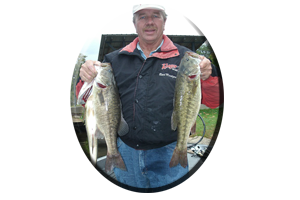 Many of these huge, largemouth bass are fooled with a variety of lures fished from top to bottom, generally fishing in shallow, weedy main lake flats and flats in backwater feeder creeks, during the cold, winter months of December, January and February. Warming trends always have an effect on these Guntersville lake bass that spend their time feeding in shallow, weedy waters. Cold fronts all but shut them down and warming trends always get them very active, usually after 2-3 days of consecutive warm days and warm nights. In Alabama, like during the beginning of this winter in December, it can get in the mid to upper 70′s often for more than a week at a time, showing winter water temps soar from the low 50′s into the upper 60′s. 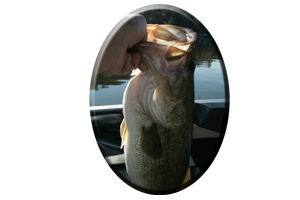 This triggers these largemouth bass to move into shallow water feeding for several days and nights at a time. That is, until conditions return to normal, winter time weather lows, slowing down their metabolism and making them slower to react to your lures. Its all a matter of timing. 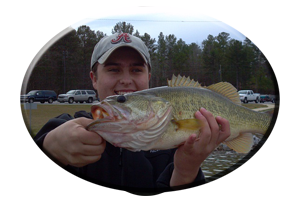 I took a young man on a trip to Guntersville Lake a few years back in December, that developed into a very memorable day. It was a Christmas gift he had received early, so we went a few weeks prior to Christmas. I say he was young, but actually he was a teenager, but with very little fishing experience. His biggest bass to date, was a 4 1/2 pounder, he had caught in his grandfathers pond on a plastic worm. So that day was dedicated to him catching one lone bass. One trophy bass he could get mounted and have bragging rights the rest of his life. Luckily for me the weather cooperated and he got his wish. It was a week long warming trend and the bass were moving shallow and feeding more and more with each passing day bringing up the water temps a few degrees. I saw the water temps that week go from a previously two week cold front of mid 40′s water temps, to 60 degrees in just a few days. On this day a cloudy rainy front was approaching and evening showers were forecasted. Perfect wintertime warming trend conditions for targeting big bass in the shallows of Guntersville lake. After all, the water temps had risen over 15 degrees! I explained to him that even when it only rises from the upper 40′s to the low 50′s they will still hit a topwater lure and that I had taken bass on topwater lures in 43 degree water temps. He looked a little skeptical after I told him that. He wanted to fish a lure he had never fished before, a zara spook. He had heard this was my favorite topwater lure so a little guidance was at hand, as I showed him how to rig the lure and how to cast it and create the enticing now famous, walk-the-dog method with this old topwater lure created in the early 1900′s. I tied on a zara super spook. This zara super spook is a newer version of the old original zara spook. The older zara spook had 2 hooks and no rattles. The Zara Super Spook has three hooks and rattles (See: www.lurenet.com) and it walks a lot easier than the older zara spooks. It is also heavier with a thicker body and the zara super spook casts a lot further and is more wind resistant. Well, after a few casts the young man could not have gotten a better example. A blow up got both of our attention as a largemouth bass exploded on the lure at exactly 3 p.m. in the evening! The spook disappeared and the bass dove down into the weeds. Luckily the hooks and the 20 pound test line held as I swung the bass in the boat and soon a largemouth bass looking to weigh about 5 pounds was laying in the bottom of the boat. The young man was awestruck! I knew he was now convinced, so I took a break and watched him cast the spook as it slowly began to rain. He already had his rain suit on and just kept on fishing the spook learning to master its enticing walk with each and every cast. It was a joy to behold, but I was getting wetter as the rain suddenly increased. I donned my rain suit thinking about how thankful I was the 5 pounder was not a mounting size bass. On these days often there is only one or two real trophy size bass taken and I was hoping the next explosion I heard would be a real wall hanger on the end of this anxious young man’s rod. With the rain suit hood over my head I did not hear the explosion I was listening for. But a sudden jarring of the boat got my attention as I turned and saw the young man setting the hook time and again as he battled an obviously huge Guntersville lake bass. It was a scene I’ll never forget. Neither will he. This was the bass of a lifetime for this young man and I was just hoping we would just get it in the boat. Earlier I had coached the young man on landing a large bass. Often, this panicky moment is when trophy bass are lost at boat side. We had tied a good knot, checked his line for nicks or unseen scrapes, checked his reels drag, adjusting it properly. Not to tight that results in broken line or straightened out hooks and defiantly not to loose of drag, that always results in loosing a bass that is not hooked very well. Seeing how good the bass was hooked and then reeling in the bass was explained. Most importantly was landing the bass. I had told him I’ll submerge the net all the way down to the handle and you just lead the bass into the net with as little pressure as possible. He handled it like a life long pro and soon the battle was over, the huge bass was worn down and we netted it with thunder and lightning now coming in fast. He exclaimed, ” I got my trophy bass”! I knew we had to go, due to the severe weather approaching. Always a time to get off the water as fast as possible. So we just threw, what looked like a 10 pounder, in the live well of my Ranger bass boat and headed back to the boat launch…both of us bearing a smile that could easily make your mouth sore later. So keep in mind no matter what lure your throwing at these Guntersville Lake bass, you can hook into the bass of a lifetime like this young man did on his winter time trip. Oh, how much did it weigh? Eight pounds and twelve ounces to be exact. Not as big as it looked, but big enough to ensure that this young man would have a lasting memory hanging on his wall for the rest of his life! Also the bass was big enough that his father (who had given him the Christmas gift guided trip), called me the next day for booking another trip. 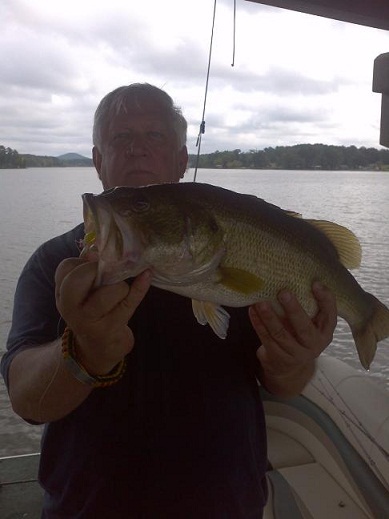 A week later his father had the same “big bass expression” on his face as his son had, with an 11 1/2 pound largemouth bass was laying in the bottom of the boat, taken on an old Lunker Lure buzzbait topwater lure. But that’s another story. 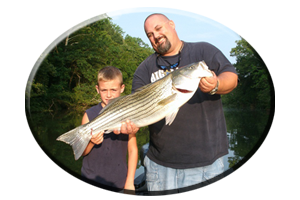 Give a Guntersville lake gift to one of your loved ones that loves to fish, this Christmas season. Certificates available online. Or any occasion such as Birthdays and Fathers Day. Or just book a trip to sample Guntersville lakes waters this winter and spring with Reeds Guide Service. 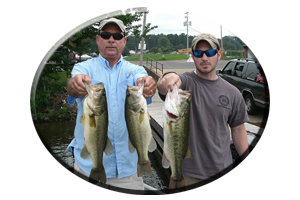 “Guntersville Lake’s oldest professional guide service fishing and guiding on this lake for over 40 years.” Several professional guides and boats available year round for multiple parties and corporate guided trips.